One of the challenges we face in modern society is preserving the meaning of holidays for our children. This is true of Christmas and Easter, but even the National Holidays like President’s Day, Labor Day, and Memorial Day have lost their soul for many Americans. These have become bonus vacation days, rather than a day to reflect, pray and remember. In addition to parades and picnics, it is up to us to impart to our children the import of the sacrifice so many brave men and women have made in the name of freedom and justice. As Catholics, we also remember that those who have passed continue in a relationship with us in the Communion of Saints. One day last week, I took a walk with my Augustyne. At 5-years-old, he assured me that he would keep up and not compromise my exercise, which isn’t hard since he is in much better shape than I! I took him my usual route, through one of our town’s older cemeteries. Once he learned how to spot the grave of a veteran, he pointed out every flag on the grounds, searching for soldiers and hoping that they died peacefully at home long after the war was over. When we turned back to our street, he said, “I didn’t know that cemeteries aren’t scary!” He is right. A cemetery is a place to pray and remember. One important and simple way to infuse a day with meaning is through song. Most adults know their patriotic songs and hymns. Unfortunately, many children do not. Do not assume that your children are learning these songs in school. Stick to just a verse for the little ones, but introduce The Star Spangled Banner, God Bless America, My Country Tis of Thee, etc. I know my grandfather, a World War II veteran, would have chosen music as the way to be remembered. He was the musical heart of our family and to this day, I most often remember him through an old barbershop tune, or one of his favorite hymns like, I Come to the Garden Alone. So teach your children a new song this holiday and perhaps take a stroll through a local cemetery. 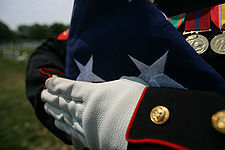 Appreciate and use the freedoms we enjoy to honor the sacrifice of our soldiers. Teach your children to pray for those who fought to defend us. Eternal rest grant unto them, oh Lord, and let perpetual light shine upon them. May they rest in peace. Amen. I lost two close friends in the jungles of South East Asia when they made the ultimate sacrifice in service to their country. 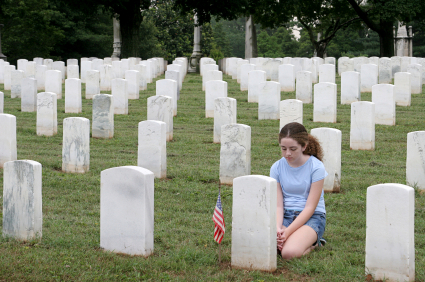 Thank you for really reminding us that Memorial Day is not just an extra holiday. Even year during this time I will find some quiet time and sit at the table all alone and remember my lost friends. I will pray for them and thank them for introducing me to the Church. And then I will pour three “shots” of whiskey. And I will make a toast to each of them. Personally, I think there are too many holidays that no longer have meaning to the younger generation, so should be discarded. President’s Day and Labor Day are two I think should be removed. Most workers I know have to work on Labor Day (so much for honoring the workers, unless you happen to work for a federal or state office..then you have the luxury of a four day weekend). President’s Day really isn’t necessary. I think as Catholics, it would be better to do special events on religious-related holy days, like on Marian feast days. The children will learn from them (virtue and holy teachings) rather than just eating hot dogs or going out to shop. The theater musicals still produce worthwhile music. This year is the first year ever our city parade did not have a fly over. Budget constraints was the excuse. How pathetic is that? pull us back together, all three are broken.